THE RISE AND RISE of the Crossover/SUV breed means that customers are spoilt for choice, so it's no wonder that many buying decisions favour the looks. Even if you don't base your choice on ability and performance, you wouldn't be wrong if you chose Skoda's Karoq purely for its must-have SUV styling. Like its handsome big brother  the large five/seven-seater Kodiaq SUV  the mid-sized five-seater Karoq is identified by crisp lines and sharply-creased body styling. The Karoq actually has a more predatory face, with wide but narrow LED headlight 'eyes' set either side of a rakishly backward-sloping, vertically-slatted black grille topped by a profiled clamshell-style bonnet. Pronounced and flat-cut wheelarches and strong lower-door sculpting lead your eye back to the cut-in, boomerang-shaped tail lights and cleanly finished tailgate. Together it all earns the Karoq a large tick in the 'kerb appeal' box. But then what's under the bonnet (and elsewhere under the Karoq's skin) will quickly validate any decision made by your heart and not your head. Especially if it's the new 148bhp 1.5-litre turboed TSI petrol engine with 'cylinder-on-demand' technology. For the record, there are alternatives: a turbocharged 1.0-litre three-pot petrol with 113bhp and, for those 'remainder' oil-burner fans, a brace of TDI turbodiesels  a 113bhp 1.6 and a 2.0-litre fielding 148bhp. All engines can be partnered with either a clean-changing six-speed manual or fluent seven-speed DSG automatic gearbox. Should you want 4WD you'll have to take the 2.0 turbodiesel with the DSG; all the other powerplants are wired in to 2WD. And just so you know, going DSG doesn't harm the performance or the economy. Predicted to be the number one choice with buyers, the 1.5 four-pot is impressive both for its performance and also for its smooth and refined character. Naturally 184lb ft of torque, spread across a wide rev-range and kicking in from 1,500rpm, helps, giving it plenty of mid-range urge that makes for confident overtaking manoeuvres. Measure its eagerness by the time it takes to get off the line and pass the 62mph post  8.6 seconds  and it's equally impressive. Top speed is expectedly well above the legal limit, at 126mph. While the DSG 'box does a fine job left in charge of the shifting, there's a useful Sport mode as well as paddles on the horizontal spokes of the steering wheel for drivers inclined to some manual intervention  either for overtaking or when towing. Furthermore, the SE L also comes with Drive Mode Select offering four distinct driving settings: Normal, Eco, Sport, and Individual. And while it can clearly get a move on, it doesn't slurp the unleaded. So unless you're an Air Miles Andy for the road, this 1.5-litre petrol engine is the common-sense choice. Officially it returns 50.4 miles for every gallon it drinks in the Combined Cycle but as we all know, lab-produced figures are rarely representative of real-world driving  even so, a hard-driven week in the hands of MotorBar's testers resulted in an overall average of 43.1mpg. Given the Karoq's size and performance, that's more than acceptable for a five-door, five-seater mid-sized SUV. Although you'll never catch it in the act, this new 1.5-litre has a clever party trick to boost economy. Whenever you've lifted off or are driving on a very light throttle between 1,400 and 4,000rpm and at speeds up to 70mph, two of the four cylinders, like actors between parts, will be 'resting'. However, the moment your right foot orders up more acceleration the slumbering pair instantly come back on stream. This Cylinder On Demand technology is said to save almost an eighth of a gallon (half a litre) of petrol over 62 miles. 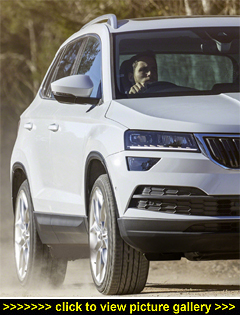 Get behind the three-spoke, leather-wrapped, multifunction wheel and it's obvious why so many want to step-up to a SUV, be it medium flavour like the Karoq or large like its big brother, the Kodiaq  the driving position is first-rate as you sit high off the floor, can see the bonnet's front edge and sides, and enjoy fine views of the road ahead so placing the Karoq accurately and jockeying in rush-hour or school run traffic is a totally de-stressed  rather than the usual distressed  experience. Adding to the pleasure of feeling in control are sports-style heated front seats, smartly upholstered in Alcantara with effective bolstering; both have large, easy-to-grip backrest adjuster knobs, long bases providing excellent under-knee support, adjustable lumbar support, and adjust for height (even after cranking up the seat base, an average-sized person still enjoys a fist-and-a-half of headroom! ), all of which makes them as satisfying for laid-back travel as they look. Keeping the driver in the loop is an instrument cluster with classy but clear instrumentation and displays; flanked by two dials for revs and speed is a colour driver's computer that shows you all you need, particularly the all-important digital speed readout. A short glance to your left takes you to the high-set eight-inch infotainment touchscreen with navigation  the 3D mapping is pin-sharp with easily-read street names and super-fast in/out zooming. A rearview camera is slaved to the display plus there's voice control (for navigation, telephone, media, radio), and integrated WiFi Smartlink+ for meaningful smartphone interaction. Increasing your entertainment options is a DAB radio and Bluetooth, and if Sounds R U an extra �550 will bag you a persuasive Canton sound system. Not everyone is enamoured of controlling the climate using their fingertip, especially on the move, so the 2Zone system's control panel with knurled rotary knobs just below the touchscreen will get a thumbs-up from many drivers. However, the electric parking brake with auto-hold definitely makes life easier, especially in stop-start traffic. Also appreciated will be the generous in-cabin storage including a lit, lined, damped and cooled glovebox and the outsized open box under the height-adjustable and sliding front armrest, as well as door bins that honestly hold 1.5-litre bottles and a large rattle-proof coin box, plus a drop-down glasses holder above the auto-dimming rearview mirror. Naturally the usual high-end items such as keyless entry and start, powerfolding heated door mirrors with auto dimming and boarding spots, privacy glass from the B-pillar back, front and rear parking sensors, power windows, etc, are all present and correct. And not only is the cabin genuinely inviting, with its light ambiance and upscale gloss black and metallic finishing and soft-touch trim, but it's refreshingly quiet  not just when you're cruising motorways, but pretty much all of the time. Safety-wise the Karoq's more than fit-for-purpose with a five-star EuroNCAP rating, a full set of airbags, Front Assist with autonomous emergency city braking and pedestrian monitor, cruise control with speed limiter, Electronic Stability Control, a driver fatigue sensor, automatic wipers and lights (with tunnel activation), full LED headlights with adaptive front light system and LED daytime running lights, LED cornering front fog lights, LED tail lights, tyre pressure monitoring, and height-adjustable front seatbelts. A surprising number of people expect higher-riding SUVs to handle exactly the same as more ground-hugging hatchbacks. Fortunately for them, some of the very latest generation SUVs do; and the Karoq is one of them  despite riding 'tall in the saddle' it can be hustled along without the driver having to really think about it. The steering is accurate with decent weighting and body lean is well managed for taking a clean line around corners and through the twisties, where you might be pleasantly surprised at how good grip and stability prove to be; even sudden changes of direction don't feel at all unsettling. In truth, handling-wise the Karoq is agreeably nimble while doing everything you ask of it  and all without a drop of drama. In keeping with the nicely settled way the Karoq drives down the road, the ride is correspondingly comfortable. With a well-fettled suspension and forgiving 50-profile Bridgestone tyres wrapped around its 18-inch alloys, the Karoq deals with our speed-humped and cratered British blacktop in a compassionate manner while remaining composed. Confirming that, no complaints were ever heard from those travelling in the back of the Karoq. Settle back in the rear cabin and enjoy the ride  good advice, and for those relegated to the back seats it's no hardship thanks to multi-adjustable backrests. And with the wide central seat's backrest down (forming a high and well-padded armrest with built-in cupholders) passengers will feel like they're at home sitting in a proper armchair. There's a full fist of headroom and the sliding seats can provide generous legroom tailored to each individual rear passenger  and all with very good knee and foot room too. Deep, long side windows keep it light and airy and other niceties include back door bins capable of holding bottles as well as other 'stuff', plus air vents for the climate control to properly cool or warm the back passengers. Youngsters will find plenty of uses for the pop-up picnic trays attached to both front seatbacks; adults will equally appreciate the tablet holders (optional) that can be fitted to the front headrests. Attracting praise from every quarter is the Karoq's 'Varioflex' rear seating system that as well as making it easy to remove all three (split 40:20:40) second-row seats for some �ber load-lugging duty, you can also take out just the centre section and then slide the two outer seats inward (they're mounted on a rail) to provide additional shoulder room and in the process create a more spacious four-seater than when left in the standard configuration. A brilliant idea executed brilliantly. Ticking the box for the optional Family pack (just �120) gets you power-operated child safety locks, side windows with heat-insulating glass, and a very handy double-sided boot floor mat that's a real boon for muddy boots or muddier dogs. Even before you bring the Varioflex system into play  which lets you remove, slide and recline the rear seats in multiple combinations  the 4.4-metre-long Karoq presents you with a significantly bigger boot than most of its rivals: 588 litres of luggage space with the second-row seats in use. However, with all of the three separate back seats unclipped and removed you'll have a whopping van-like 1,810 litres for cargo. With the seats left in situ you have two other options: fold and tumble them (one side or both) for a significantly deeper but slightly shorter boot/bay; or just fold the backrests down in a conventional manner  they fold flat making it easy to stack regular-shaped items. A wide tailgate frame and low lip make loading and unloading back-friendly when large items or white goods are involved. And towing, should you need to, is very doable with a limit of a braked 1,700kg. Smaller loads can be carried on the chrome roof bars. Other well-considered touches include a mesh luggage blind that raises with the high-lifting tailgate, a luggage restraining net, side pockets and an upper tray, a removable self-charging LED torch that doubles as an extra boot light, repositionable bag hooks (on a rail, two-per-side), and some nifty luggage-retainers that can be attached wherever you like on the boot floor (they have velcro-covered bases) to prevent things from sliding about.